Browse Fourth of July for more articles like this. Organizers of the annual Marble Falls Community Fireworks are often asked about topics like parking, the schedule of events, and what is allowed at Lakeside Park. This list of Frequently Asked Questions (FAQ) should answer any extra questions that can’t be found at marblefallscommunityfireworks.com. • Vendors and music are still going on after showers this afternoon. The fireworks are still scheduled for about 9:15 p.m. The ground is wet, so we advice you bring chairs. According to the National Weather Service in San Antonio, another round of shouwers could pass through Marble Falls between 6:30 p.m. and 8 p.m. The storms appear to be weakening, but rain with a few lightning strikes remain possible. Follow Marble Falls Community Fireworks on Facebook for the latest updates. • Fireworks — No, these are prohibited within the city limits. • Coolers — Yes, feel free to bring a picnic. There will be food/drink vendors selling items as well. • Glass containers — No, these are prohibited at the park. • Alcohol — No, also prohibited at the park. • Lawn chairs or a blanket — Yes, please do! • Life jackets — Yes, if you plan to swim in the lake or use the rope swing, these are encouraged. • Music — Yes, you may enjoy your own music until the live music begins. Just please be respectful of others. • Umbrellas — Yes, you may set up an umbrella while the sun is an issue, but once the sun is on its way down, please lower it so everyone can have a great view of the bands performing and our spectacular fireworks show. • Money — Vendors will be set up with food, snacks, treats, and drinks beginning at 3 p.m. Bounce houses and water slides also open at 3 p.m. with a $5 wristband fee for unlimited use. What Time Does … ? • The Marble Falls swimming pool will be open from noon to 7 p.m. July 4 with free admission. • Bounce houses and inflatable water slides open at 3 p.m. These require the purchase of a $5 wristband for unlimited use. The inflatables will be set up on the tennis courts. • Food and drink vendors open at 3 p.m.
• Music begins at 5 p.m. with Matthew Butter. Southern Underground takes the stage at 8 p.m. and also will play AFTER the fireworks show — so hang around! • Fireworks start at 9:15 p.m. and last about 20 minutes. 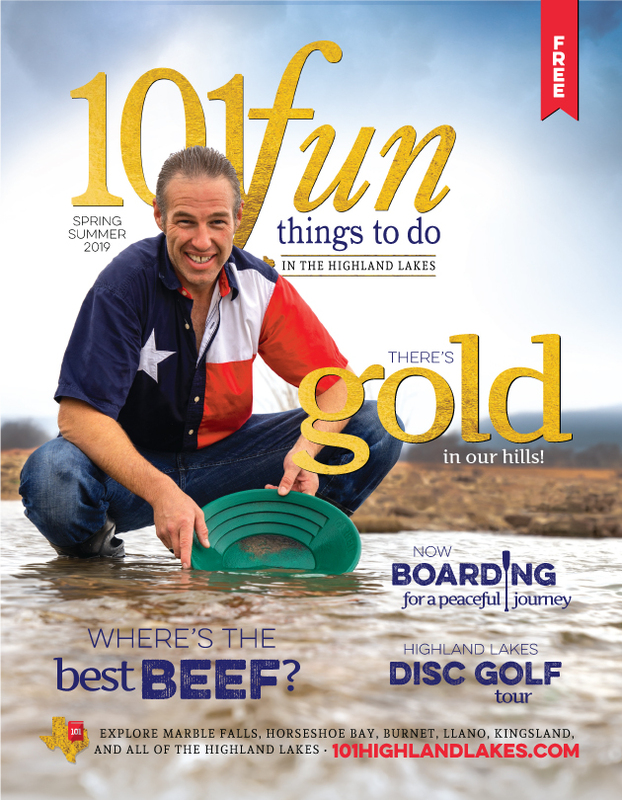 • Parking is available at Lakeside Park, Johnson Park, and Falls Creek Skate Park. Handicapped parking is at the Lakeside Pavilion. Be prepared to walk a short distance from your parking spot to Lakeside Park. Can I watch from my boat? • Yes. 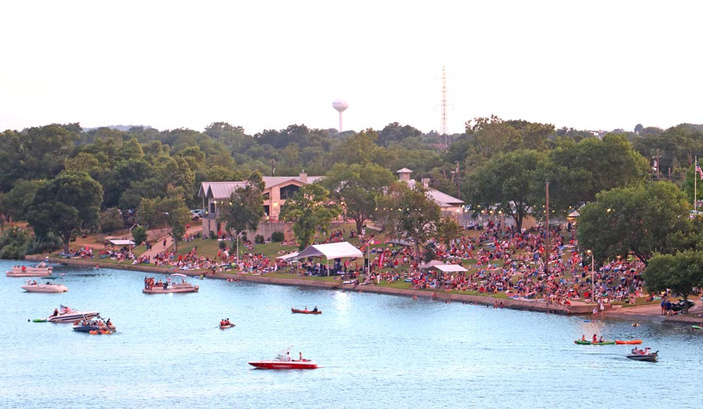 Keep in mind that the fireworks will be launched from a barge on Lake Marble Falls to the west of Lakeside Park. Barriers will be placed across the lake on both sides of the barge beginning around 8 p.m. Boaters from 8 p.m. to 10 p.m. will not be permitted to cross the barge from one side of Lake Marble Falls to the other. Is there an area to see the bands and fireworks that is easily accessible for mobility impaired individuals? • Yes! As a matter of fact, the patio at the Lakeside Pavilion will be open for mobility impaired individuals to watch the bands and the fireworks show. You will also find handicapped parking at the pavilion as well. Should I leave the show early to beat the traffic? • No — We don't want you to miss the grand finale! As you can imagine, there is usually heavy traffic immediately following the fireworks show. This year, however, Red Carpet Chaos will be playing again AFTER the fireworks show in hopes that many will stick around and the traffic will not be as congested. Marble Falls police officers will be directing traffic as needed. IS THERE AMPLE BOAT/ TRAILER PARKING IN THE AREA? ANY OTHER PLACES TO LAUNCH FROM? Can you launch a boat somewhere so you can see the fireworks from the water? Leave a reply to comment.